There’s nothing more beautiful than a smile that radiates happiness. But, because some of us like to binge on coffee, tea, wine and sugary treats – we’re often left with a mouthful of stains, which leaves us a little self-conscious when it comes to flashing a mouthful of teeth! Like with most things, however, science and technology save the day! We’ve been on the hunt for the best teeth whitening kits which can be used from the comfort of your own home. These kits are easy to use, are affordable and are excellent in helping to remove stains and whiten yellowed teeth. We’ll help you get your smile back! Some of us simply don’t have the time to visit the dentist for endless teeth-whitening appointments, or the process is one that our health insurance refuses to cover. 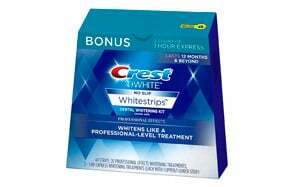 With the Crest 3D kit, you can have whiter and brighter teeth simply by adding to your home beauty/health regimen. As our first and best choice, all you need to do is stick one of the Seal Technology’s no-slip grip teeth whitening strips along your teeth once a day for 30 minutes. You’ll see a whiter smile after 3 days of continuous use, and full results in just 20 days! These strips are convenient, effective and easy on the pocket. Ready to say “cheeeese”? If you are struggling with bad breath, make sure you also check out our top toothpastes for bad breath and find your favorite. While these refills are a premium choice, they are best used in conjunction with the GLO Brilliant Personal Teeth Whitening Device. They conveniently fit into your dopp kit(or even your pocket) and can be used on the go (perfect for those who are always in a rush)! Simply squeeze the gel on to the connected applicator brush and apply it to your teeth. Leave on for 8 minutes and then rinse your mouth thoroughly (do not swallow). 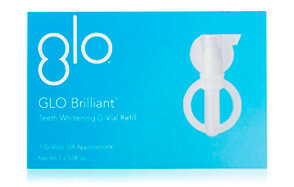 As a vegan teeth whitening solution, the GLO Brilliant Whitening refills are also free from parabens and sulphates. If you don’t mind prancing around your home with an awkward mouth-piece sticking out from your lips, then the advanced technology of the AuraGlow Teeth Whitening Kit might be what you need if you have super-fast results in mind. Equipped with a mouth tray and LED light for a more effective and instant treatment, this nifty kit gives results after just one treatment! While it’s not the comfiest of whitening systems and you’ll have to wear the mouth tray for at least 30 minutes per treatment, if it’s fast results you need then this is the way to achieve a decent set of pearly whites. Not only is this home whitening kit vegan-friendly, but it also accommodates all sorts of lifestyles by being Kosher and free from gluten, parabens, and sulphates. The Cali Deluxe Vegan Whitening Kit comes prepped and ready for an ultimate whitening experience and includes both a universal tray for ease of use as well as two Thermoform trays for a more custom and comfortable fit. Simply use the gel applicators to squeeze gel on to a tray and then insert the tray along with the LED light into your mouth, fitting it firmly over your teeth. Netflix and chill while you let the mouth-piece and gel do its thing for the next 10-30 minutes. 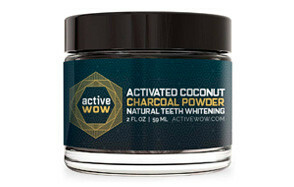 If you are looking for a natural teeth whitening product that offers the best value for money, then you might just want to grab yourself a tub of Active Wow. Made from the highest quality natural ingredients which include organic activated coconut powder, Bentonite, and orange seed oil; this natural teeth whitener whitens teeth gently and over time while also polishing out built-in stains. Simply place a little powder onto your toothbrush and then brush your teeth thoroughly for 1-2 minutes, leaving them black and soot-like. Rinse thoroughly once done. Cut from the same brand as the Cali Deluxe Whitening System, this Cali White Vegan Teeth Whitening Kit features organic botanical gel with no peroxide, making it a more natural addition to the Cali range. Using natural ingredients like Baking Soda, Cranberry Seed Oil, Aloe Vera and, Chamomile to whiten teeth 2-8 shades in just 7 days, you can brighten your smile while taking care of your gums at the same time. This system comes complete with Thermoform trays for a custom fit as well as a universal mouth tray for convenience. The accompanying LED light clips in with the trays and accelerates the natural teeth whitening process, making significant instant results. NiteWhite ACP is one of the best teeth whitening bleaches that naturally fills microscopic tooth defects, which means that it smoothens out tooth enamel and adds a sparkle to your smile! To use the gel syringes, you’ll need to purchase a mouth-tray separately (you should be able to get one from your local dentist). Squeeze the gel into your tray and insert it into your mouth, ensuring that your teeth fit into the grooves. Leave your tray in for a maximum of 1 hour per day (leaving it in for longer or overnight could do damage). You’ll start seeing results after 7 days of continuous daily use. Love this product? Check out our dental floss review for more great products that will help you take care of your teeth. If you have to keep to a small budget (like most of us do) and prefer a convenient home teeth whitening kit that lets you carry on with your day comfortably, then the reputable Rembrandt brand could possibly pose as the best whitening strips suited to your requirements. With a secure grip and full teeth coverage, this whitening treatment meets professional dentistry standards and offers noticeable results in 7 days. Who would have thought that a thin and sticky strip would have the potential to brighten up a smile and help you avoid those nasty dentist bills! If no mess and no fuss is your preference, then the easy-to-use Go Smile applicators should be right up your alley! No awkward mouth-trays or sticky strips required here! Simply snap open one of the vials and apply the gel-like bleach directly to your teeth. Leave on for 20 minutes before rinsing thoroughly. While convenience is definitely key with the GS134 Super Whitening System, the ingredients are a little on the harsh side and include Alcohol, PVP, Hydrogen Peroxide and artificial flavourings. 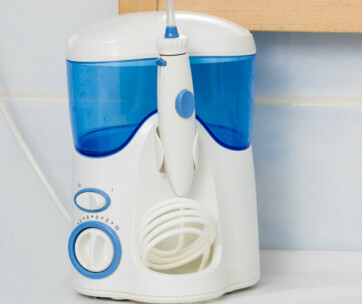 To extend the life of your teeth, make sure you also check our water flossers guide for our top picks. Who needs to visit a stuffy and intimidating dental office when you can go al-natural and whiten your teeth from the comfort of your own home! Free from harmful chemicals, bleach, fluoride, additives and GMO – Dental Duty Toothbrite’s Activated Coconut Charcoal is the best teeth whitening method to opt for if you are worried about what you are putting into your body. But, like everything that’s good for you, the results aren’t as instant or as permanent as the more scientifically advanced brands that include peroxides and other stronger chemicals. Finding the best over the counter teeth whitening kit can be difficult – there’s just so many options to choose from and all you want is to smile with confidence! While home kits are convenient (both in use and for our bank account), there are a few dodgy brands out there which might do more harm than good. So, in an effort to enhance your smile instead of deteriorating it, we’ve gathered a list of our favourite kits which include a variety of strip, gel and powdered products. What does quality mean to you? Does it mean the use of safe ingredients? Assurance that the product will stick to its promise? Perhaps the quality you look for in a product is ease-of-use and practical functionality? Well, we’ve rounded up a selection of dental whitening kits that take a holistic approach to the quality they deliver. We take our reviews straight from the horse’s mouth, and in this case, the horse is boasting a shiny set of pearly white teeth. We read what people have to say about the products they use, we then measure their experiences with what the product promises to deliver, and then make our own researched consensus. A brand holds a reputation and when we scoured the net for the best teeth whitening system, we took this reputation into account. Not only do we consider the functionality and quality of a brand, but we also seek to find manufacturers who offer pleasant after sale experiences and assured warranties. OK, so it’s a bummer that we have to shop according to a budget, but budget we must! When we compiled our list of teeth whitening kits, we looked at their prices and rounded about a variety of products that would fit into varying budget scopes – all while keeping quality and a shiny bright smile in mind. Ease-to-Use - We’re all busy people and while whitening devices that come equipped with mouth-trays and LED lights might offer the best results in the shortest time, often our rushed lifestyles simply don’t accommodate this palaver. If this sounds like you, perhaps strips or gels that can be applied with a quick rinse after use are your best bet? Pain Tolerance - If you find yourself flinching in pain when you bite into something hot or very cold, then you want to settle on a kit that offers teeth whitening for sensitive teeth. At first, it might be best to avoid cold gel whiteners while you work on your tooth (and gum) sensitivity. You can also look out for brands that help strengthen teeth and gums while whitening – a double whammy! Type of Whitener - This all narrows down to a personal choice. Some prefer strips and gels because they are slightly more convenient to use, while the charcoal powders tend to be more natural and even vegan friendly. The type of whitener you choose will depend on your values, what you feel comfortable putting into your body and what will fit snugly into your daily routine. Treatment Time - While treatments that take a little more time to do their thing tend to be the ones offering more instant results, there are a few products (also included in our list) which offer just as quick results when compared to their more timeous counterparts. Treatment times vary anywhere from 8 minutes to an hour. Some of the treatments can be done while you carry on with your daily routine, while others need you to be a little bit more on the still side. What kind of time do you have on your hands? Taste - Some people aren’t fussy on taste, they just want to get the job done. Others, however, might have a more sensitive gag reflex and are a little fussier when it comes to flavour (and even texture). Before you make a purchase, make sure you select a product that mentions flavour, and that the flavour will be suited to your taste buds. Price - With most things in life, you get what you pay for! In most instances, a more quality product is going to be on the pricier side. If you do a little research however, you’ll be surprised to see that often there are brands who care about customer satisfaction and can cater to your budget while still offering a superior experience. Even those who brush, floss, and see their dentist for regular check-ups may find that lifestyle and even just the passage of time will eventually take a toll on the colour of one’s teeth. Luckily there’s a solution, two solutions in fact! Pay a visit to your dentist and ask them about what professional whitening treatments they offer, or, grab yourself a DIY kit from your local store. Whitening Toothpaste – Superbly convenient! Simply brush your teeth with a tooth-whitening paste twice daily, as you normally would, and combat germs and protect your teeth from cavities at the same time! 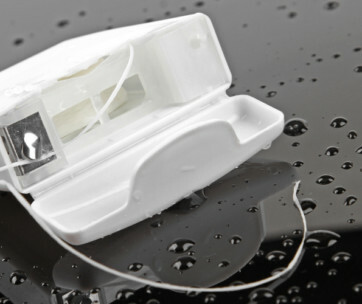 Whitening Gels – Gels usually contain peroxide for fast whitening results and are often used together with a mouth tray, which fits snugly around your teeth to hold the gel in place. Whitening Strips – These are sticky strips that cover your teeth while removing stains and bleaching them. Whitening Kits – These kits generally come with gel applicators (or syringes), a mouth-tray and a LED light which work together for fast and professional results. If you’re not 100% sure that even the best teeth whitening kit is going to work for you, or perhaps DIY is just not your thing, then off to the dentist you go! Most professional dentists use bleaching gels made from hydrogen peroxide (the same ingredients found in most kits) and much like the LED lights that you can purchase, they will intensify the treatment by shining a powerful light onto your gel-covered teeth for a certain period of time. Another more recent practice that dentists are using to whiten smiles is to use a Laser Whitening technique. During this process, the dentist will add a whitening compound to your teeth and then use a pen-like laser to activate the compound. The compound is activated to form a foam, which removes stains as it bubbles. Don’t expect instant results after just one treatment. While you might notice that your chompers look a little less yellow after one whitening application, more visible results can be seen after a week of continuous use. Take breaks in between kit usage. Constant use of teeth whitening kits could weaken your tooth enamel, or give them a grey/blue tone. Most at-home kits contain peroxide, which varies in percentage (anywhere from 10% to 22%). The higher the peroxide level, the stronger the treatment will be. To avoid tooth sensitivity or a “burning” sensation however, start with the lower peroxide leveled products and work your way up. Q: What is a Teeth Whitening Kit? A: A teeth-whitening home kit comes equipped with the ingredients and apparatus you will need to whiten your teeth while at home, without a professional’s assistance. Each kit will include a gel solution, sticky strips, a paste or a powder which contains the necessary resources to bleach and whiten teeth, either naturally or with the help of safe chemicals. Q: Why do teeth turn yellow? A: Tooth discoloration falls into two main categories: extrinsic and intrinsic stains. Extrinsic stains are caused by food, drink, medication and bad habits, like smoking cigarettes. These stains are easy to remove and can be prevented by following healthier lifestyles. Intrinsic stains, however, appear due to genetics or health problems which affect the inner structure of your teeth. Extrinsic stains are harder to treat and remove. Q: Should some people avoid teeth whitening kits? A: The short answer, yes. If you have cavities or teeth that are very sensitive, then it’s best to avoid whitening kits until you have sought professional advice and assistance. Whitening agents can make cavities worse and tend to make sensitive teeth even more sensitive. Q: Are the effects of a teeth whitening kit permanent? A: While some teeth whitening solutions may rid your teeth of stains and some yellowing, no treatment offers permanent whitening results. There are treatments that last for quite some time however, or at least until bad habits re-stain teeth. This simply means that you should apply a whitening treatment at least every 3-4 months, for a continuous bright smile. Q: Are at-home teeth whitening kits as good as the whitening treatments in a dentist’s office? A: There certainly are over-the-counter whitening systems that meet professional dentistry standards and are often endorsed by leading dental practitioners. Most kits include the exact ingredients and equipment that a dentist would use in a whitening procedure, although they might not meet a professional’s quality standards.